Sea vegetables are rich in minerals and trace elements, including calcium, magnesium, iron, potassium, iodine, manganese, chromium and more, at levels much greater than those found in land vegetables. Sea veggies also provide vitamins, fiber, enzymes, and high quality protein. Take advantage of this and all the other properties that marine phytochemicals and iodine from kelp have to offer. 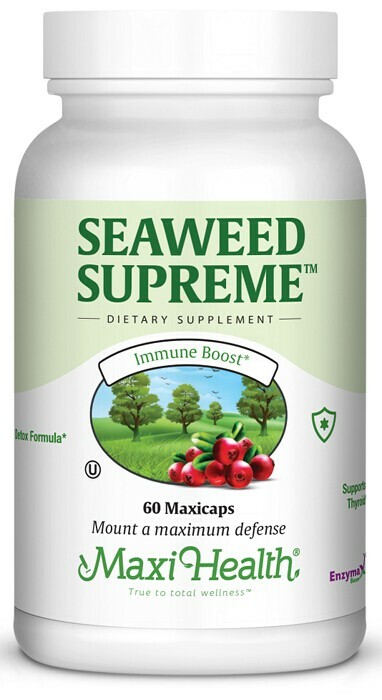 Try Seaweed Supreme™ today. Other Ingredients: Microcrystalline cellulose, vegetable cellulose, magnesium stearate, and Enzymax® (calcium carbonate, bromelain, papain, lipase, amylase, protease, silica). This product contains no animal products, wheat, salt, soy, gluten, sugar, yeast, milk, artificial flavors, colorings or preservatives. Note: If pregnant, nursing, or taking thyroid medi-cation, consult your healthcare practitioner before using this dietary supplement.